The objective of this post is to briefly describe JGrass-NewAGE system for those who wants to apply it for their research, starting from scratch. For this, obviously, one need to have what is JGrass-NewAGE and its philosophy. The good starting point is the paper of Formetta et al. 2014 and Formetta et al. 2011. Both papers give the first and simplified overview, without going into details of any of the components of the system, of what is JGrass-NewAGE system. 1. Define your control volume of your research interest: the first thing is to define your control volume. Are you interested for a particular hydrological processes at site specific, or is it at a single hillslope unit, or a basin scale which has internal spatial variability ? If it is at site specific/a single hillslope, you need to prepare the point/polygon shape file for which hydrological quantities are required to estimate. Any GIS can be used to prepare the shape file. In the case of basin scale modelling, however, the preparation of the digital watershed model is based on customised GIS for a particular model is usually the prerequisite. Hence, in JGrass-NewAGE, we used Spatial toolbox endowed with various JGrasstools that can automatically extract the GIS information that is necessary for hydrological simulations. The theoretical (and practical) understanding of this GIS tools and the procedures need to be followed are presented in Formetta et al. 2014 and Abera et al. 2014 papers. So one need to start from this steps if wanted to use NewAGE system for a basin scale modelling. 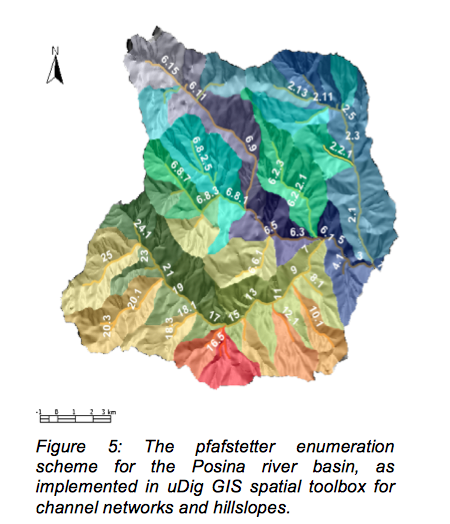 The final goal of this step is to obtain two GIS data: (1) the river network enumerated according to various channel coding systems and also the pfafstatter systems, and (2) the HRUs polygon shape files with some attributes such as area, elevations etc. One can use the GIS interface of Spatial toolbox, now integrated in gvSIG GIS, or s/he can use this sim file that can automatically extract the two GIS data set from DEM (note that I didn't explain what is sim file and what are the prerequisite installations needed to do this sim file). 2. Modelling solution of any of the components: once you have the proper control volume, the next step is to define your research interest. Are you interested in spatial interpolation of any meteorological forces having some in-situ data? are you interested to estimate energy (addition) budget, or Evapotranspiration, or discharge or storage? This is important question you have to address, because it is important to deal with the right component. If you are interested in the whole hydrological system, in this case, you need to use all the components. Since the motive of the object modelling component framework, which NewAGE is based, makes it easier to connect all the components to simulate the last output, hiding the intermediate. Now lets start what could be your interest, and mention some of the modelling solutions. A. Interpolation of meteorological data. 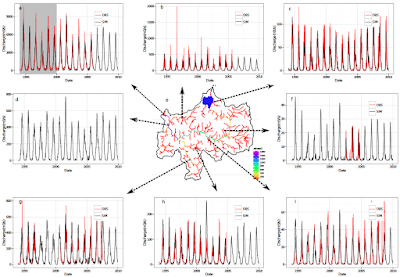 If someone has few meteo measurements, but are not enough to capture the spatial variability of the basin, then, what we generally do is generate time-series data for each control volume. Details on this can be found here, and the sim file that can automatically estimate the spatial information can be found here. B. Modelling shortwave and long wave radiation, from which Net radiation at both site and areal scale can be estimated. If you don't have these meteorological forcing but needed for your research, you can pick these components and generate one/all forcing (shortwave radiation, long wave radiation, and net radiation). The sim file for such activities, with good documentation can be found at geoframe blog. C. Evapotranspiration modelling. 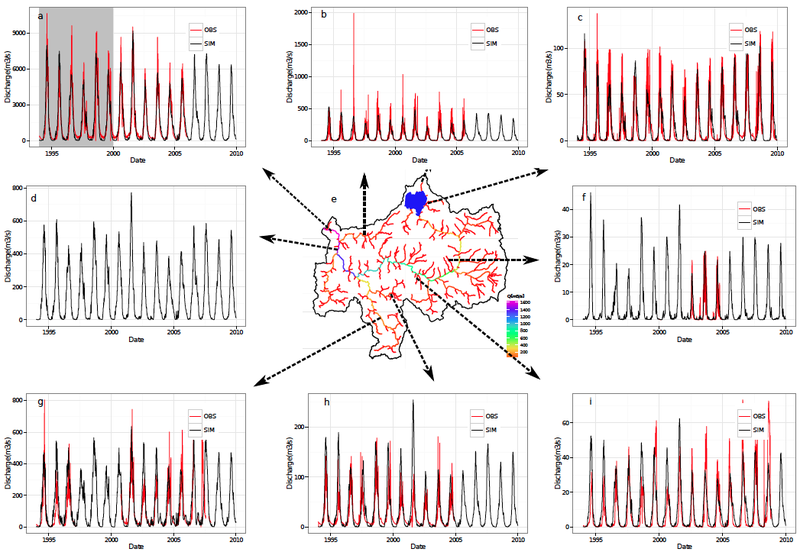 Once the net radiation estimated as energy component, and temperature interpolated with the interpolation component, then this component can be used to estimate the potential evapotranspiration of each control volume. D. Rainfall-runoff modelling. 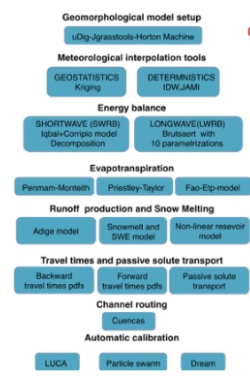 similarly the inputs to the rainfall-runoff model are prepared by the above components (i.e kriging for interpolation the rainfall, and net radiation and the evapotranspiration component to generate the evapotranspiration time series data) and the rainfall-runoff component uses the two GIS data set defined in step one, to solve discharge at each river links in the basin. A sample paper on the procedure is given by Formetta et al. 2011 and Abera et al. 2016. If your case, in terms of data availability, is different from this steps e.g if you don't have measured data, an exemplary work on the integration of JGrass-NewAGE system with satellite data can be find at Abera et al. 2016. 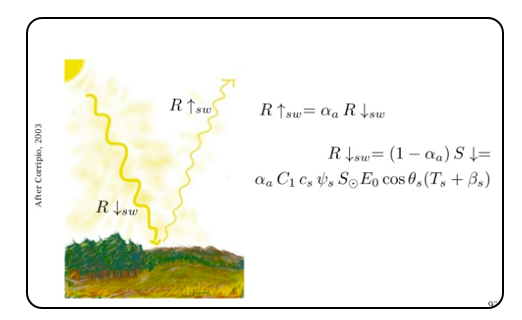 - Modeling shortwave solar radiation using the JGrass-NewAge system, Formetta eta al. 2016: this show you the detail model of shortwave and how to connect this component with the calibration component. Once you define your research to use JGrass-NewAge, you can focus at the component of interest. I hope this can give you some tips. Of course plenty of information, slides, presentation about JGrass-NewAge is available at AboutHydrology blog. If you have a clear idea on what do you want from JGrass-NewAge, the team members are happy to work with you.